Lucky Chops saxophonist Daro Behroozi gives pointers to local students during a music education clinic held at Edison State Community College. Following their performance at the 21st annual Holiday Evening at Edison State Community College, the high-energy brass funk band Lucky Chops put on two Music Education Clinics for over 370 area junior high and high school jazz students. Lucky Chops set the stage for the second-day music education clinics by performing several top songs, including their original composition, “Without You,” a cover of The Jackson Five’s “I Want You Back,” and a mashup of several genres of music. Junior and senior high schools represented included Ansonia, Arcanum, Benjamin Logan, Hardin-Houston, Lincoln View, Miami East, Miamisburg, Mississinawa Valley, Piqua, Sidney, Tipp City, and Troy. 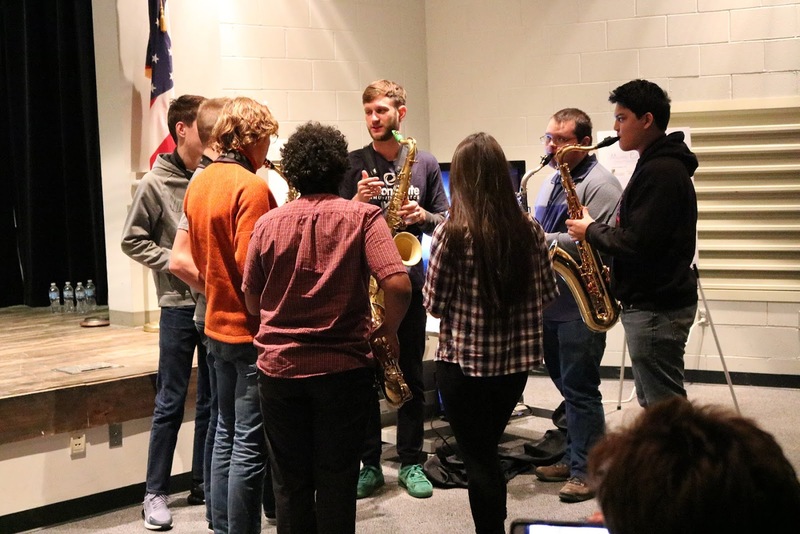 The Edison State Music Education Clinics were made possible by the Miami County Foundation, The Piqua Community Foundation, and The Edison Foundation. Photographs, as well as a video, from the day can be viewed online at www.edisonohio.edu/clinic.